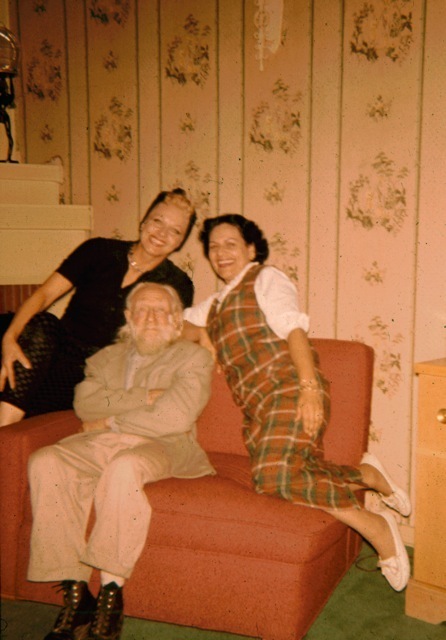 I had two very eccentric grandmothers by the names of Thareen Auroraa and Mimi Reed. They were terrific women who worked in Burlesque and “Showbiz” for many years. They lived on Reklaw Drive from 1946 until their deaths in 2005. They knew Peter the Hermit. a little drink or two too. Peter certainly got around. Readers of this blog will know that he was widely photographed throughout his life in Los Angeles, and that his image turns up in all kinds of unexpected places. Coincidentally, just today I was shown another photo of Peter–an unusual cyanotype portrait done in the 20s by a well-known Hollywood photographer. I hope I’ll be permitted to show it in the future. An exponential rise in visitors to the Hollywood Sign has brought not only picture-taking throngs in the middle of traffic but the daily phenomenon of cars traveling well below the posted speed limit on Beachwood Drive. On the mile-long stretch between Franklin Avenue and the Hollywoodland Gates, the posted speed limit is 30. Yet the average tourist–status verified by out-of-state plates, rental car stickers and a penchant for running stop signs and not using turn signals–takes it upon himself to drive at a leisurely 20 mph, the better to take in the view. The mile-long stretch between Franklin Avenue and the Gates has no stop lights and only two stop signs. At the posted speed of 30 mph, it took me 1 1/2 minutes to drive it at 6:45pm today. Yet it often takes five times as long, an inexcusable length of time for such a short distance. Getting stuck behind tourist traffic on Beachwood Drive is getting more common–and more frustrating–every day. If you’re reading this and contemplating a visit to the Hollywood Sign, please drive at the posted speed. If you need to take a photo, please pull over, signalling first, and let the driver behind you pass. I’m thanking you in advance, not just for myself but for everyone concerned. the Hollywood freeway in 1947. So our visits stopped. 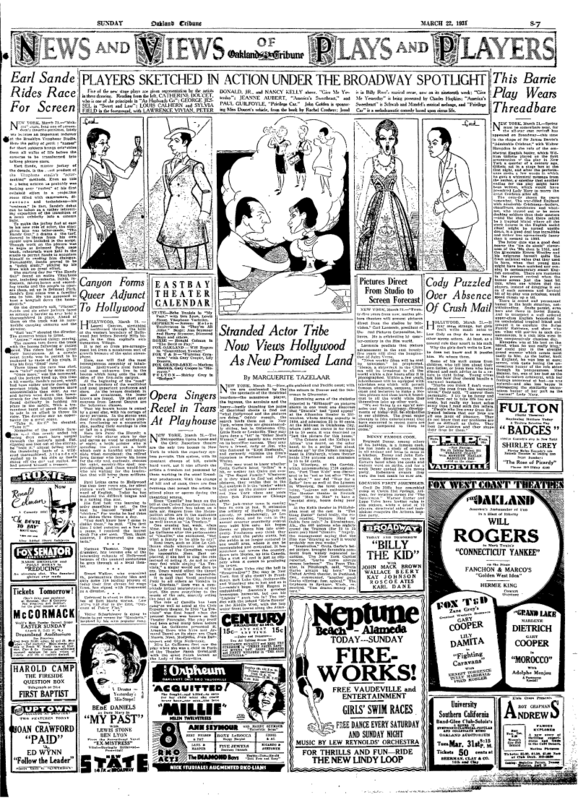 A trendsetter in every aspect, Peter not only made himself a brand (in the 1920’s!) but dropped out of society in an era when doing so was decidedly odd. But the times eventually caught up with him: when Peter died, in 1969, the hippie era was in full swing. It must have been gratifying to see the back-to-the-land movement, which he apparently pioneered during the Depression, in full flower. 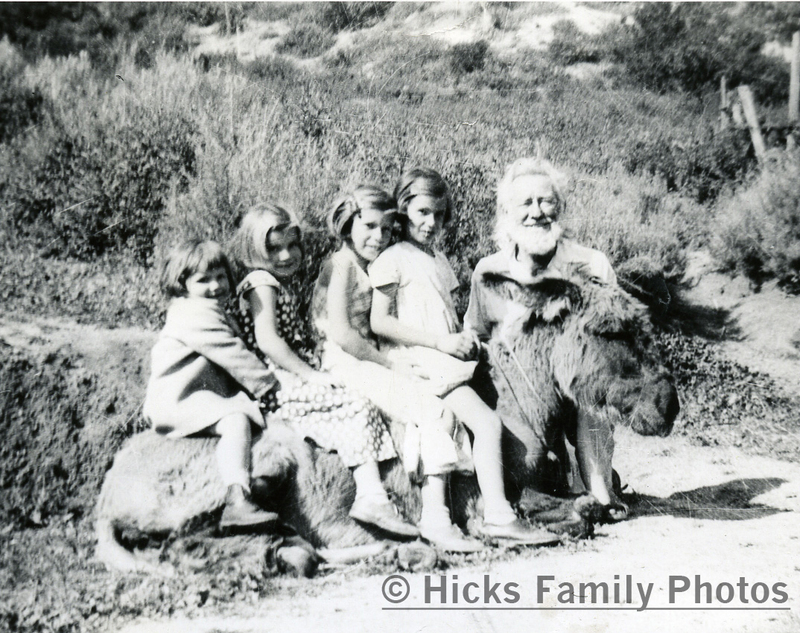 Tom Montgomery sent this wonderful 1933 photograph of Peter the Hermit with his mother and aunts posed on his donkey. From left to right are Anne (Hicks) Siberell, Elizabeth (Hicks) Granfield, Dorothy (Hicks) Constantine, Margaret (Hicks) Montgomery, and Peter. 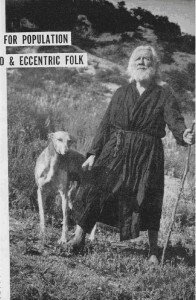 As I learned from a news article, the Hermit fled Hollywood for the much more bucolic Laurel Canyon because of construction noise in the late 1920s. He probably commuted to Hollywood Boulevard by streetcar (see “Hollywood Before the Movies, Part III: Mansions and Streetcars,” July 6) in order to ply the tourist trade during this period and, as evidenced by the photo above, found additional subjects in Laurel Canyon. 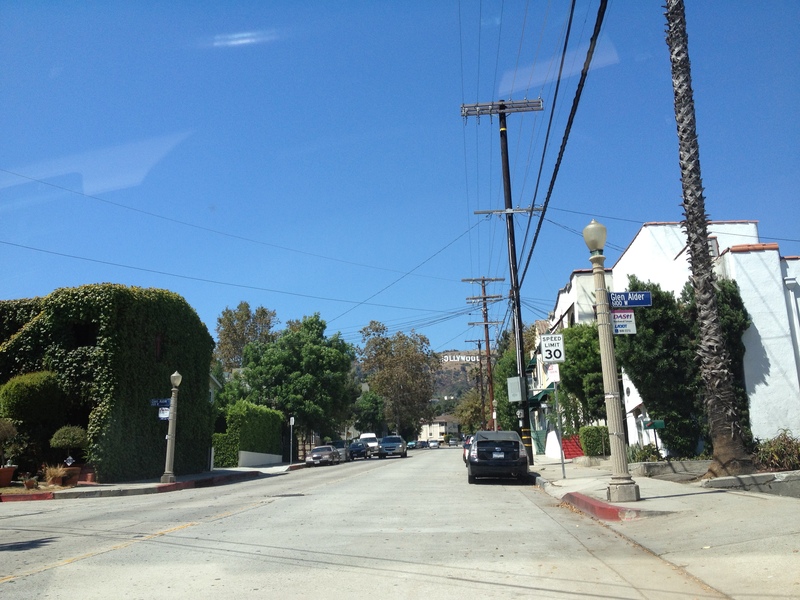 Eventually he returned to Beachwood Canyon, a much more convenient commute to Hollywood Boulevard. If anyone knows the dates of his residence in Laurel Canyon, please let me know. The actors and actresses all come to me for advice: Jane Russell, Lana Turner, Marilyn Monroe. They come to me to learn of the higher spiritual world and to be healed. His sideline was in keeping with the local tradition of alternative religions. Hollywood’s embrace of unconventional spiritual practices began with the Theosophical Society’s relocation to Beachwood Canyon in 1911. 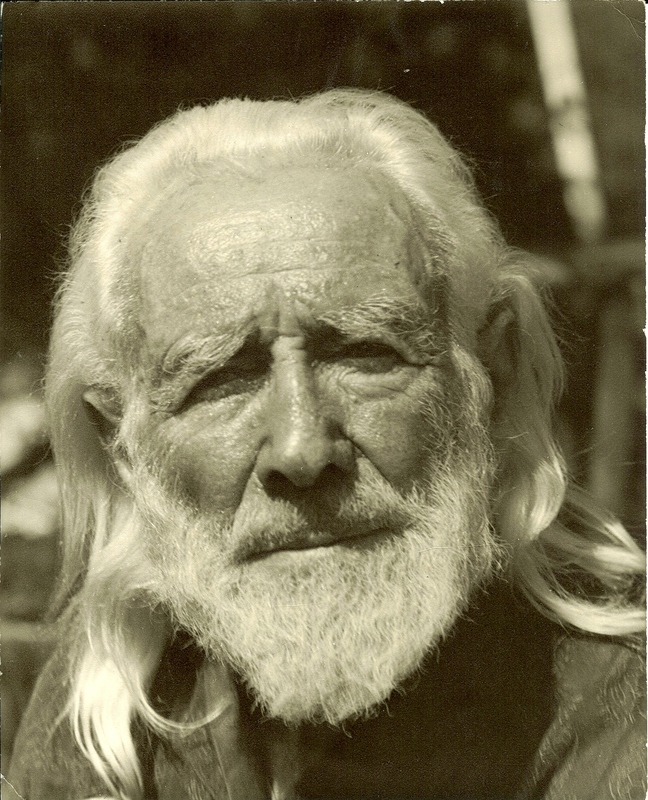 (For background, see my post from June 2, 2009, “Alternative Religions, from Theosophy to Scientology: A Hollywood Tradition.”) Actors such as John Barrymore and Charlie Chaplin soon took notice of the Krotona Colony, whose artistic, bookish members welcomed rather than shunned them as “movie people.” For denizens of the nascent film industry, the appeal of Theosophy probably stemmed both from its relative lack of dogma and its occult aspects. Seances, a happy combination of mysticism and theatrics, quickly became a Silent Era fad, attracting practitioners who had no interest in Theosophy, or any other system of belief. In counseling movie stars, reading auras and offering mystical platitudes, Peter continued a Hollywood tradition, but his canny entrepreneurialism was a break from the past. Unlike the Theosophists, who relied on wealthy benefactors, Peter the Hermit knew how to make a living from his spiritual talents. Though he resembled a Biblical prophet, his business model was distinctly modern, pointing to the present day. In contemporary Hollywood, agrarian utopias like the Krotona Colony are unknown, after all, but self-made spiritual advisors abound. 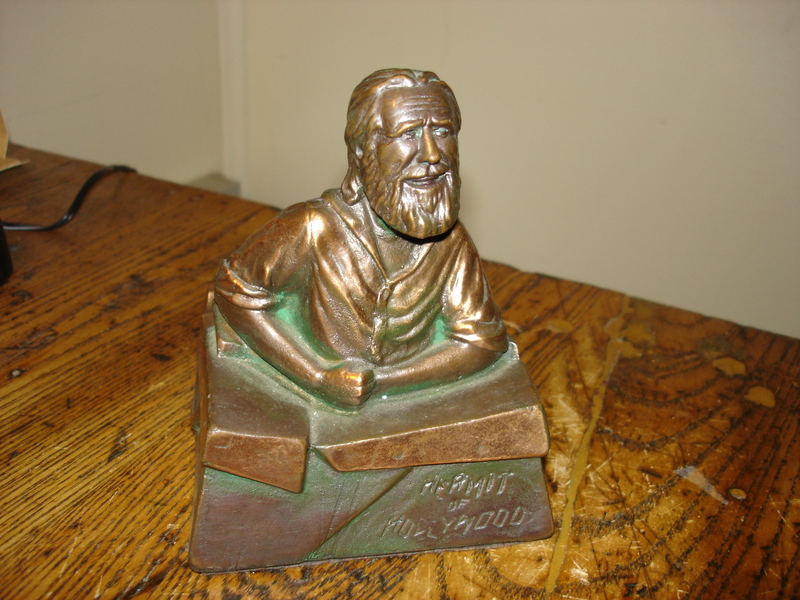 Richard Hatfield sent me these pictures of a bronze bust he recently bought of Peter the Hermit. 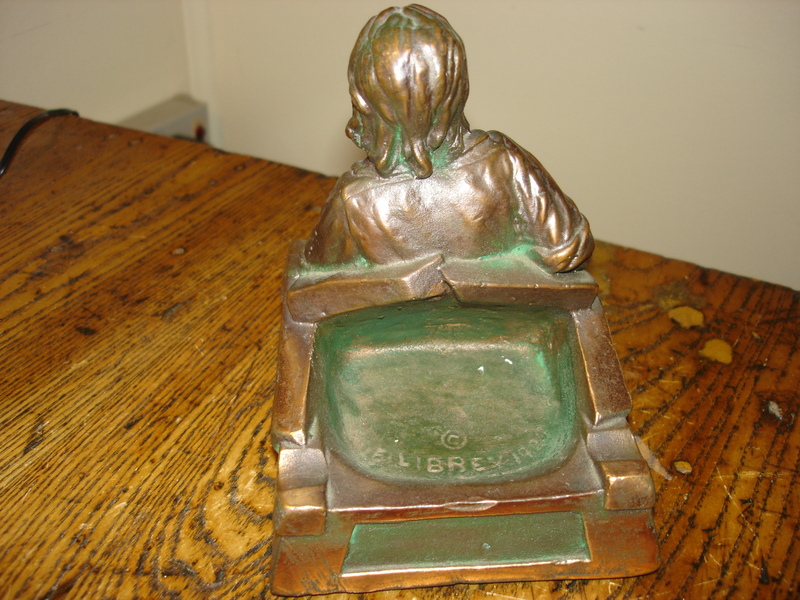 Like Jean Hawkins’ bookends, it appears to have been produced for the tourist trade in the late 1920s. Not bad for a man who lived in a tent, hermit-style, in Beachwood Canyon. Peter turns out to have been a canny entrepreneur, supplementing his picture-posing income with a trove of memorabilia. In contrast to today’s imitators, he was unfettered by competition and faced no legal issues by profiting off his Biblical character. Still, his inventiveness and marketing savvy put them to shame. You are currently browsing the Imitators category at Under the Hollywood Sign.